Caribbean Carnival, like those in Rio and New Orleans (Mardi Gras), is traditionally a big blowout party leading up to the solemn season of Lent in the Christian calendar. 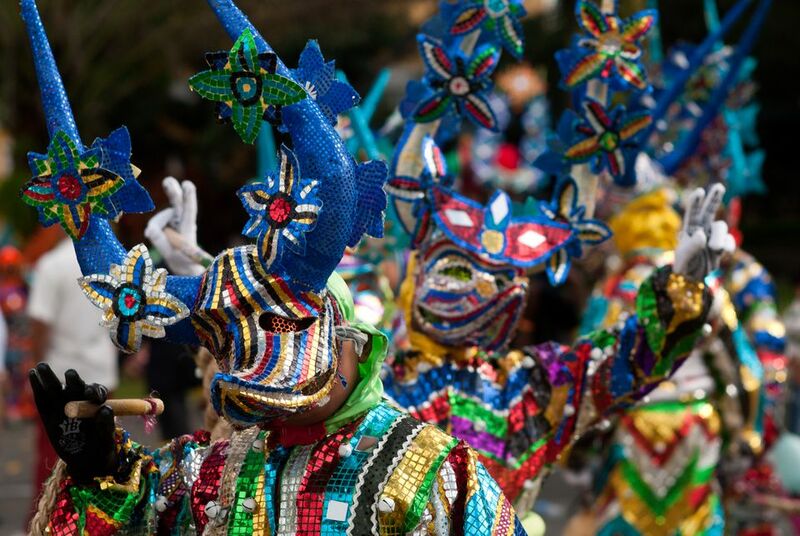 While many Caribbean islands celebrate Carnival in the days leading up to Ash Wednesday—including Trinidad & Tobago, whose Carnival is world-famous— others hold their Carnival celebrations at other times of the year. Exact days can vary from year to year. For example, Barbados calls its Carnival "Crop Over," a traditional harvest festival that takes place in August and St. Vincent's "Vincy Mas" is one many Carnival celebrations held in the summer. The good news for visitors is you can likely find a Carnival celebration almost any time of the year. Some islands even have Carnival events stretching over months from the Feast of the Epiphany in January to Ash Wednesday in February or March. Note: In the listings, the locations with "Lent" in parentheses will celebrate Carnival in the traditional season, which can fall in February or March depending on the date of Ash Wednesday and Easter Sunday that year. Can't make it to Carnival on any of the dates? No worries—there's always some sort of party going on in the Caribbean with amazing events each month. The history of Carnival is a convoluted one, with origins that can be traced back to Italian Catholics in Europe, before migrating to the France and Spain. Ultimately, the event was brought to the Caribbean islands like Trinidad, Dominica, Haiti, and Martinique, by foreign colonialists. The end of slavery in the region around 1834, ushered in the modern version of Carnival in the Caribbean. Locals embraced the celebratory aspect of the party to revel in their new found freedom with dancing, music and wild costumes. If you've never been to Carnival in the Caribbean before, make sure to plan ahead for a safe and fun experience—veteran Carnival-goers know that preparing to "play mas" begins months, not weeks, ahead of time. The key to a good Carnival is booking tickets and lodging well in advance before the hotels and airfare are sold out. Bring comfortable footwear, and remember to keep an eye on your belongings while dancing through the crowds.